The black plastic covering the fence along the former Walgreens lot at 8120 Santa Monica Blvd. is down, probably wrapped by the time you read this in “The Kicks of Route 66,” a colorful mural celebrating the 90th anniversary of Route 66. Route 66, known as the Main Street of America, was one of the first national highways. It was established in 1926 and ran from Chicago to Santa Monica, passing through Missouri, Kansas, Oklahoma, Texas, New Mexico and Arizona and West Hollywood along what is now known as Santa Monica Boulevard. Route 66 was officially removed from the federal highway system in 1985, with most of it replaced by the federal Interstate Highway System. The Kicks mural — 33 panels each 7 feet high by 684 feet long, was commissioned by WeHo Arts in partnership with West Hollywood’s Department of Public Works from the artist team YoMeryl. It depicts the diversity of landscape and culture along historic Route 66 and celebrates its terminus in California. The 8120 Santa Monica lot was purchased by the City of West Hollywood from Walgreen’s last year. YoMeryl (Bronwyn Lundberg and Sarah Zucker) is a pop art Studio based in Los Angeles that specializes in animated GIF and public art. Bronwyn Lundberg is a painter and illustrator known for her iconic work, “The Lesbian Last Supper.” She holds a BFA from Virginia Commonwealth University. Sarah Zucker is a writer/director and media artist. She holds a BA from Northwestern University and an MFA from New York University, and is a “Jeopardy!” champion. The exhibit features brightly colored anthropomorphic shoes travelling the road, implying individuals from every walk of life, and also paying tribute to the popular song “(Get Your Kicks on) Route 66,” composed by American songwriter Bobby Troup and originally recorded by the King Cole Trio. These bold characters with fun faces pop-out from the background in a style reminiscent of traditional cel-based animation. The mural depicts the entirety of Route 66, as day turns to night, with expressionistic renderings of famous landmarks, such as the Blue Whale of Catoosa and West Hollywood’s Barneys Beanery. The installation begins tomorrow and should be done by Thursday. The images include: Gateway Arch (St. Louis, Mo. ), The Blue Whale of Catoosa (Catoosa, Okla.), Cadillac Ranch (Amarillo, Tex. ), Brontosaurus Family (Santa Fe, N.M.), Hollywood Sign (Los Angeles, Calif.), Sunset Junction (Los Angeles, Calif.), Formosa Café (West Hollywood, Calif.), Neon sign from Baby Blues Café (West Hollywood, Calif.), Laurel Hardware (West Hollywood, Calif.), Neon sign “The Diver” (West Hollywood, Calif.), Emser Tile (West Hollywood, Calif.), Barney’s Beanery (West Hollywood, Calif.), The Night Clubs of Santa Monica Boulevard (West Hollywood, Calif.), The Troubadour (West Hollywood, Calif.) and Santa Monica Pier (Santa Monica, Calif.). 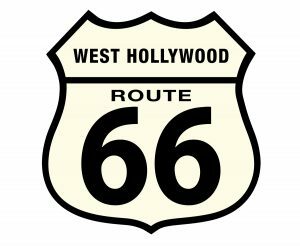 The City of West Hollywood also will celebrate the anniversary of Route 66 with a street party on Sunday from 2 to 4 p.m. on Santa Monica Boulevard at Holloway adjacent to the Sal Guarriello Veterans’ Memorial and to Barney’s Beanery. There will be tastes of chili from Barney’s Beanery, which was established in 1920 and became a classic Route 66 diner; classic soda pop; live music by Murphy’s Flaw, whose “Eclectigrass” mix of bluegrass, jazz and country will get people dancing, and a display of classic Ford Mustangs from the 1960s, courtesy of the car club ClassicStangs. There will also be Route 66-themed giveaways with a West Hollywood flair. WeHo’s Route 66: The Starwood — White Punks on Dope, or White Dopes on Punk? Looks ugly and cheap to me. Your a little off on the date Route 66 was established. It wasn’t 1966 but instead November 26, 1926.